Former Grand-Am racecar driver Henri Zogaib has been arrested and jailed in Florida for the felony crime of organized fraud, the Florida Department of Law Enforcement (FDLE) said. Once known for living large, Zogaib, 36, of Longwood, Fla., is listed as an inmate in the Lake County Jail. His bail was set at $100,000. 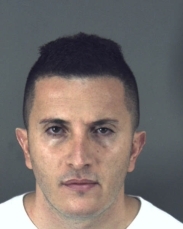 He is accused of stealing “approximately $5.1 million from 19 different victims across the country who had invested their money with Zogaib through his company, Executive Investment Group,” police said. Among the victims were fellow racecar drivers. The crime of organized fraud, also known as the Florida Communications Fraud Act, is a felony in Florida that may carry a maximum prison term of 30 years. The arrest culminated a joint investigation by FDLE, the Volusia County Sheriffâ€™s Office and the Daytona Beach Police Department into allegations that Zogaib operated an organized Ponzi scheme, authorities said. Quick note: AdSurfDaily members might want to familiarize themselves with the crime of organized fraud, which has a communications component. Still want to tell autosurf investors to monitor the growth of their money in their electronic back offices (numbers on a screen) while pushing autosurf 80/20 programs?